Window Garden Veg Dangler Large - Clear Suction Cup Plant Hanger - holds up to 10 lbs. 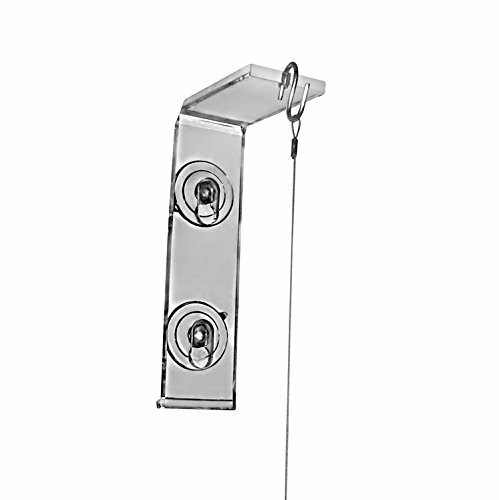 Window Garden Veg Dangler uses powerful suction cups and a patent pending weight bearing design to securely adhere to any window or mirror, holds up to 6 lbs. There are so many uses for the Veg Dangler! Ideal for hanging herbs, veggies, or flowers in your window. Also great for displaying decorations like terrariums, figurines or seasonal decor. No need to drill holes in your wall or trim, adhere a Veg Dangler to a window and create your Window Garden today! The suction cups are high quality and will adhere extremely well but only to CLEAN smooth surfaces like glass or tile. Air leaking behind the suction cup is the only reason suction cups fail, so it is imperative to clean surface. See Veg Dangler instructions. Veg Dangler Installation: ¥ Install only to smooth non-porous surfaces such as glass or tile. ¥ Suction cups adhere best with indoor air temperature between 40? and 95?F. ¥ Make sure the suction cups and the surface are clean. Use cotton ball with alcohol to clean surface and suction cup and then dry with a paper towel. ¥ Slightly moisten suction cup. ¥ Adhere the Veg Ledge to the surface by pressing suction cups all the way down against the surface. ¥ To remove, peel the edge of the suction cup off the surface to release the suction. Maintenance: ¥ Periodically burp suction cups by pressing down on them to remove any air that may have seeped in. ¥ Suction cups may get cloudy over time, which will affect performance. Remove and clean with warm water, use a mild dish detergent if needed. Wipe dry with a lint free paper towel or cloth.